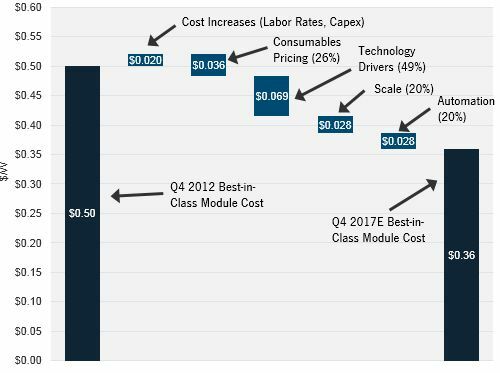 GTM Research’s latest update on the future of module manufacturing costs was released earlier this week, and there has been quite a bit of discussion around its findings on solar module cost and its ramifications. Below, we attempt to clear the air around some key points of debate. Most of the initial coverage on the report has focused on our top-line 2017 base case estimate of $0.36 per watt for low-cost Chinese manufacturers (see below). Many on this site and others have expressed a mixture of consternation and disbelief at how apparently low this number is. “Amazing, but hard to wrap my head around,” said one of the Twitterati. “Crazy numbers,” said another. To be honest, I don’t quite understand what all the fuss is about -- 36 cents per watt at the end of 2017 implies a compounded annual decline of less than 8 percent from Jinko Solar’s reported Q4 2012 manufacturing cost of 54 cents per watt (down to 51 cents per watt in Q1 2013). Is that so difficult to conceive of? That is a very small rate of decline compared to the cost reductions experienced over the past three years. 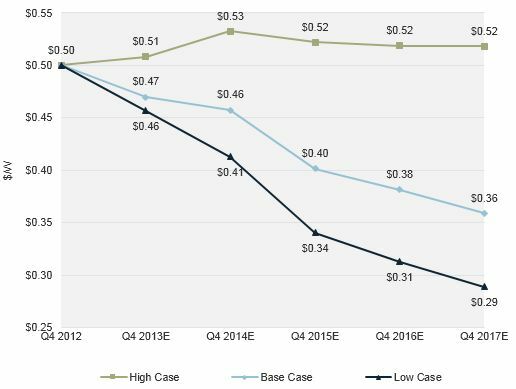 From Q4 2009 to Q4 2012, Trina Solar’s all-in module cost dropped from $1.29 per watt to $0.61 per watt, which is a compounded annual decline of 62 percent. 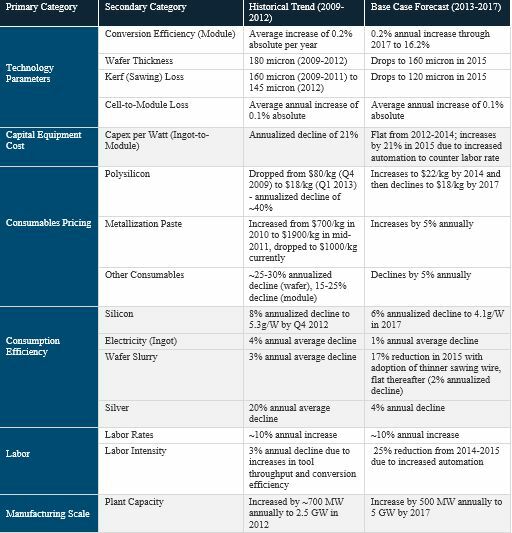 As the table below makes clear, our base-case forecast has a relatively conservative outlook on metrics such as consumables pricing, plant scale-up and technology parameter trends (increasing automation aside) than in years prior. Our blended silicon price estimate ($18 per kilogram in 2017) is the same as it was at the end of 2012, our outlook for pricing for other consumables aside from metallization paste is incremental, and our technology modeling does not assume a fundamental shift in process flow or device architecture for multi c-Si modules. In other words, no FBR silicon, no quasi-mono, no frameless modules, no selective emitters, and no diamond wire sawing (for multi). If anything, I would have expected criticism along the lines of “too high” rather than “too low” -- and indeed, as our low-case estimate of $0.29 per watt (more on this in a moment) makes clear, there is definitely room to run below our base-case estimate under favorable conditions. Another commonly encountered response to our $0.36 per watt estimate is that cost levels so low would trigger hitherto unforeseen levels of demand for PV due to price elasticity. Respectfully, I must disagree with this view for multiple reasons. For one, our study concerns itself purely with core manufacturing costs, or COGS (cost of goods sold) -- namely, depreciation of capital equipment, overhead (plant and property), direct labor (line workers and manufacturing engineers), consumables and utilities costs. In a severely oversupplied environment like the one we have had over the past two years, cash manufacturing cost (i.e., total manufacturing cost less depreciation and overhead) is a reasonable proxy for pricing, but this approach is unsustainable in the long run. Besides core manufacturing costs, suppliers also need to recover expenses related to executive salaries, marketing, debt service, interest expense and warranties. In other words, the core manufacturing cost is not a reasonable proxy for a rational or sustainable selling price in the long run, and to be frank, we should be doing a better job of communicating this in the future. A better proxy would be to add in at least a 15 percent gross margin on top of the core manufacturing costs, which in this case, would amount to a rational selling price of 42 cents per watt in 2017. 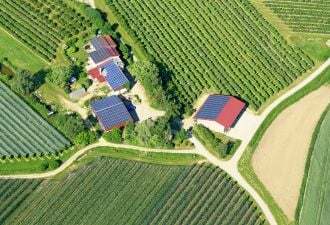 Apart from the above-mentioned reason, there is also the issue of exactly how meaningful a reduction of around $0.20 per watt in module prices (from $0.62 per watt at the end of 2012 to $0.42 per watt in 2017) is in the overall context of PV economics. Assuming an installed cost of $2.25 per watt for a utility-scale system in the U.S. right now, our base-case forecast implies a system cost reduction of less than 10 percent. At the risk of undermining the importance of the report, it’s not exactly a game-changer at the system or LCOE level. Thus, if there’s any takeaway from our base-case estimate, it’s that the burden of influencing meaningful system cost reductions in the future lies firmly on the shoulders of the BOS side of the equation, although improvements in module efficiency will certainly help in this regard. A final issue to take note of with regard to our outlook (and a very legitimate one) is that of forecast risk. By definition, our base-case estimates represent the most likely outcome for module manufacturing costs in our view. But given that past forecasts by industry participants and independent analysts (including GTM) have often been off the mark (although directionally correct), how much confidence do we have in our base case? At the risk of surprising no one, I concede that the risk to our base-case estimates in either direction is non-trivial. There is considerable uncertainty involved in forecasting values for many of the key variables that could have a material say in the final analysis, including consumables pricing, plant scale-up, technology parameters, and device composition, to name a few. In such cases, it is arguably more important to understand the range that forecast values could realistically take on, rather than focusing on a point-estimate projection. The figure below represents the results of this process, showing our high- and low-case forecasts for best-in-class module costs over the next five years. These cases were constructed by assuming that key determinants independently and concurrently assume maximal or minimal values within a realistic range of expectations. In other words, the high and low cases represent realistic upper and lower bounds (the specific assumptions made in constructing these boundary cases can be found in the report). Under the assumptions made in our variance analysis, a realistic range for best-in-class manufacturing costs in Q4 2017 is about $0.23 per watt wide, from $0.29 per watt in the low case to $0.52 per watt in the high case. This is admittedly a wide range, although it’s worth noting that our base-case estimate is meaningfully closer to our low-case projection than to our high-case estimate. This indicates that in our minds, the risk is skewed toward the downside. 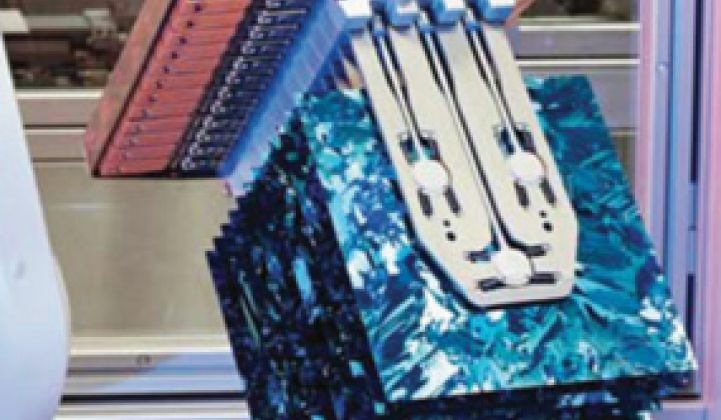 It’s also worth noting that our low-case projections do not incorporate adoption of a number of advanced technology platforms such as FBR silicon, kerfless wafering and frameless modules, all of which could serve to lower manufacturing costs to levels even lower than the numbers laid out here for firms that commercialize these technologies. We’ll continue to provide findings and analysis from the report in coming weeks. In the meantime, you can learn more about it here. Shyam Mehta is a Senior Analyst at GTM Research, where he focuses on the global PV manufacturing sector.